CoffeeShop “Square Mood Board” Set #1! Do you ever use Mood Boards? They are storyboards where you can gather a set of textures/photos that inspire you. I am personally a huge fan of them, especially to pick out complimentary colors for my designs. 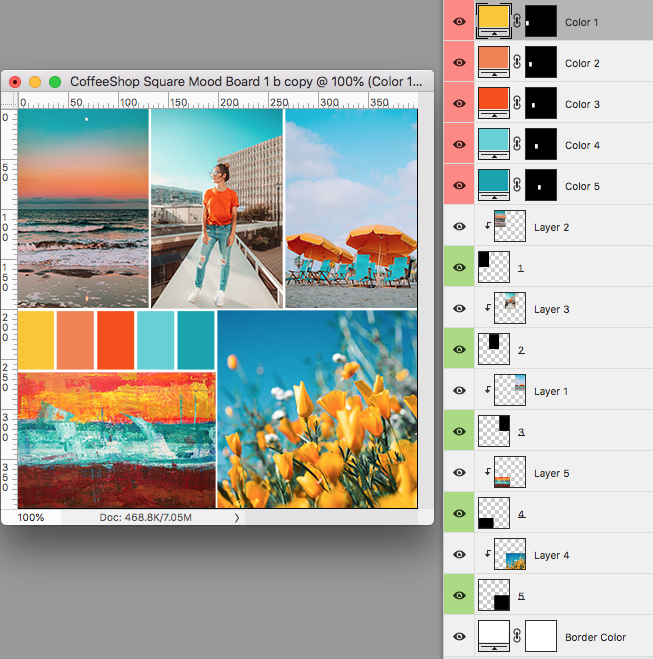 I wanted to design a new set of square mood boards for Photoshop/PSE that have built-in color palettes. Simply add your images using the included clipping masks (tutorial, quick and easy loading action) and then click on the images to grab colors for the color palette using the built-in Color Fill layers! It is so fast and easy, you are going to love using these boards. You can print these or post them on the web on sites like Instagram, Pinterest, Etsy, blogs, or websites. Feel free to use them personally or commercially, no attribution necessary (but always appreciated!). Original images used in my example storyboard: (1, 2, 3, 4, 5). This is one of the Mood storyboards. The clipping masks are located on the bottom layers. Simply clip your images to the clipping masks. The color palettes are located at the top. Click on each Color Fill layer and then click on the photos to grab colors. You can resize these bigger, just do it before adding your images. You can also make them smaller for websites. Have fun playing with them!!! Download the CoffeeShop “Square Mood Board” Set #1. CoffeeShop “Curie” Vintage Texture Set!